And they are shiny, glittery, and holographic too! 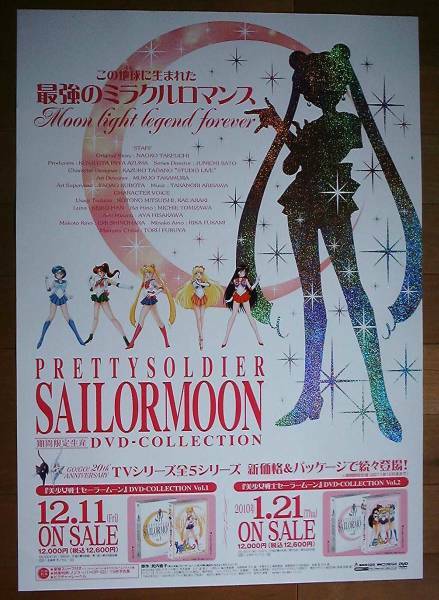 Chibicrystal posted an image in the Sailor Moon Forums, and we did some poking around and found a few available on Yahoo Auctions Japan. Fans who want to bid on these posters can use Rinkya at their own discretion. We love the glittering Sailor Moon on these posters – maybe it is a hint of things to come on the DVD boxsets? 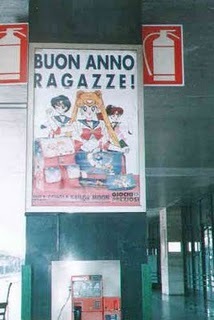 And for our Italian readers, we stumbled on this old photo a tourist took in Rome probably around 2000-2001. This poster was posted on a pillar in a Rome train station, and says “Happy New Year Girls!” It shows some nifty Sailor Moon schoolbags, and and also has the maker’s name on the poster: Giochi Preziozi. This is the same company who held the license for Sailor Moon toys and will be making new toys in the new year!